On Saturday we noted that Michael Spencer was preparing to 'blow Labour out of the water' in terms of fundraising for the next General Election. Mr Spencer, Tory Treasurer, is the subject of a much less encouraging story in today's Independent. Following a two month investigation The Independent's Martin Hickman alleges that "councils who paid [a firm run by Mr Spencer] for strategic advice were almost twice as likely to have lost money in the three main Icelandic banks as those advised by other companies." He continues: "Of the 116 local authorities who lost money, 51 received advice from Butlers. Their losses totalled £470m, more than half the total amount of council funds frozen in the banks." Although missing from previous lists Conservative Home has learnt that Labour-run Bolsover District Council has £3m with Landsbanski. Bolsover has no Conservative councillors at present so all the more reason for this website to hold them to account. The local MP Labour Dennis Skinner is normally very indignant about reckless, casino capitalist greed. I wonder what he makes of the whole thing. Shadow local government minister Bob Beill MP has written today to John Healey MP calling for an end to the leaking of information about councils' exposure in a "piecemeal" and "speculative manner". The text of the letter is published in full below. While the Government and the Local Government Association have failed to provide a full list of Councils thus far identified as having deposited money in Icelandic banks The Daily Telegraph have had a pretty good stab of it this morning. Their list shows the total approaching the £1 billion figure that Eric Pickles warned of. LibDem peer Lord Oakeshott has been enjoying himself in the media over the last 24 hours; decrying Tory councils like Winchester who made deposits with banks in Iceland. Lord Oakeshott should have looked in his own backyard before running in front of the Today programme's microphone: "Councils who have put money in Iceland banks last week, like Winchester who put £1m in a subsidiary of Landsbanki only a month ago, they must have been blind and deaf." Quoted in The Telegraph. He continued: "By mid-September, the alarm bells were ringing and red lights flashing all over Iceland and its banks. How could the council possibly have missed them?" But LibDem Sutton had £5.5m deposited with Iceland banks and made a £2m deposit as recently as the end of September. Sutton Tory councillor Paul Scully is essential reading for more. Council's Icelandic bank deposits. Can we really just blame Prescott? The big local government story remains the vast sums deposited by Councils in Icelandic banks. Is it credible simply to blame the Government because Councils were following their guidelines? In 2004 John Prescott told Councils they could invest with foreign banks if they had branches in the UK. There was vague advice about "to seek the highest rate of return consistent with proper levels of security and liquidity." But this wasn't an instruction. It was a guideline. Since when did anyone think advice from John Prescott was worth following? If Councils are less craven about following Government guidelines in future then some good will have come out of this mess. "Some of my local authorities have lost tens of millions of pounds. But my blood boils when I read the reports offered by their jobsworth accountants telling councillors that all would be well, because they 'adhered to the treasury management practices set out in the CIFPA Code'. No risk, then, No need to apply common sense." "Winchester City Council, which is Conservative-run, sank funds into Heritable, a subsidiary of the troubled Landsbanki bank, only hours after the collapse of Lehman Brothers - the event which triggered the stock market melt-down which led directly to the collapse of the Icelandic financial system, three weeks ago. Other local authorities are also thought to have continued investing in Iceland in recent weeks, despite warnings from leading financial and political experts. 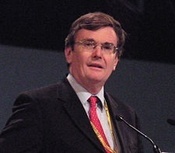 Winchester's actions emerged after Lord Oakeshott, the Liberal Democrat Treasury spokesman, clashed with Paul Coen, chief executive of the Local Government Association, accusing councils of being reckless with taxpayers' money. During heated exchanges on Radio 4's Today Programme, Mr Coen insisted that councils had abided by Government guidance. But for what it is worth this is the BBC's list of Councils which have admitted to having deposits in the collapsed Icelandic bank Landsbanki or its UK arm Heritable, or in other threatened Icelandic institutions. If your Council hasn't got a denial on their website yet then it may well be one to add.